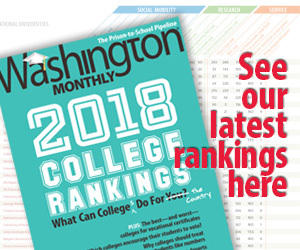 Washington Monthly | Should We Turn High School Into College? This fall, PSJA became the first large early college district n the country, where nearly all high schoolers are systematically enrolled in college courses to work towards an associate’s degree before even getting their diploma. That means the majority of students at the school will graduate from high school with at least some college credit. Since the first three early college high schools opened in the U.S. in 2002, the program has become increasingly popular as a way to transform the high school experience for disadvantaged students who have high potential for success. The idea is that introducing low-income, minority students to college coursework as early as ninth grade can help jumpstart their higher education while saving them money, and it is spreading across the nation. Now, there are 280 early college schools nationwide – nearly 50 of which are in Texas. So far, the model has proven largely successful in graduating students from high school and introducing them to college courses. Most function like magnet schools, though, with students choosing to attend or even needing to apply. PSJA is taking the original premise of the early college model – that many poor students can outperform expectations if given the chance – and pushing it to the extreme. The district wants to prove it these schools get all disadvantaged students to succeed simultaneously in high schoolÂ and higher education, and not just those who opt to be there. Nationwide, 90 percent of early college students graduate from high school, 10 percentage points above the national average, and 30 percent of students get either an associate’s degree or a certificate, according to Jobs for the Future, the Boston-based nonprofit that runs the national Early College Designs program. Research has shown that students selected for early college schools by a random lottery have higher high school graduation rates and college attainment levels than those who lose the lottery and attend a traditional high school. 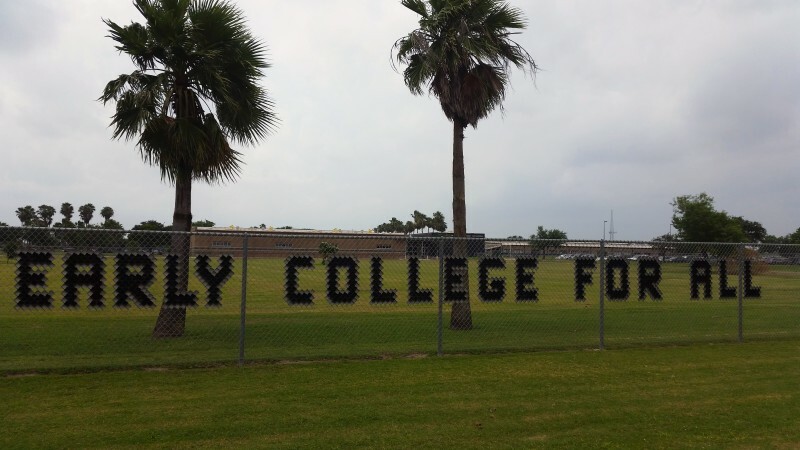 PSJA won’t be the first entirely early college district in the country. That distinction goes to King’s previous, much smaller district in Hidalgo, Texas. PSJA is attracting attention, though, because of its size and the success it’s already had in increasing the high school graduation rate from 60 to 90 percent in the past six years through dropout recovery programs and the expansion of early college. The district’s dropout rate is down to about 3 percent – half the state average. Now, incoming ninth-graders in all of PSJA’s high schools will start on the early college path. They’ll all take a college entrance exam, normally used to identify students who need remediation at the college level. The district has prep courses over the summer and during the year, and students can keep taking the test as many times as it takes. District administrators said they did not know its students’ pass rate on the exam, but said that it had not been a significant barrier. The test recently became much harder, though, and they expect to need more test prep and retesting in the future. Once enrolled in college courses, PSJA students average Bs, according to data provided by the district. Out of PSJA’s roughly 1,900 graduates this May, 60 percent took at least one college course. About 215 students graduated with an associate’s degree and 270 got a certificate. By 2019, district officials hope that at least 90 percent of graduates will earn at least some college credit, with 1,000 students earning an associate’s degree or certificate, a one-year credential given out in fields like welding, IT and medical technology. The district has gotten so many requests to see its schools from educators around Texas and from other states that it’s had to designate certain weeks to host visitors. Last fall, it held a national early college conference with 300 attendees. Krystal Balleza is a recent graduate of the early college program at North High School. She mightily approves of the district becoming universally early college, if only to save future students from the stress she felt as an eighth-grader waiting to see if she’d made it into the program. She recalls “freaking out” as number after number was called at the lottery drawing. She was second to last. 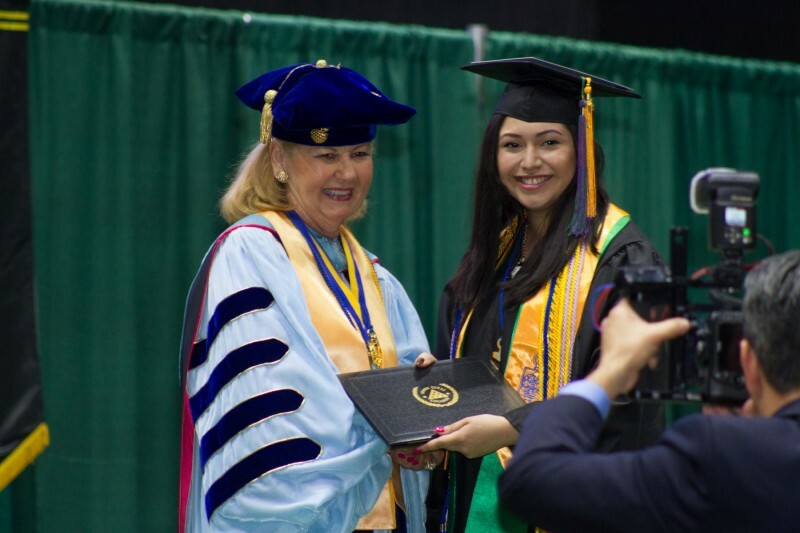 As a freshman, Balleza took a mandatory college readiness class, which taught her how to take notes and got her started researching colleges, which made the previously theoretical idea of higher education seem much more real. No one else in her family had gone to college. Her dad came to the U.S. from Mexico hoping that someday his children would have more chances than he did. Her older brother graduated from high school, but stopped there. Inspired by his sister, though, he’s enrolled in college himself. 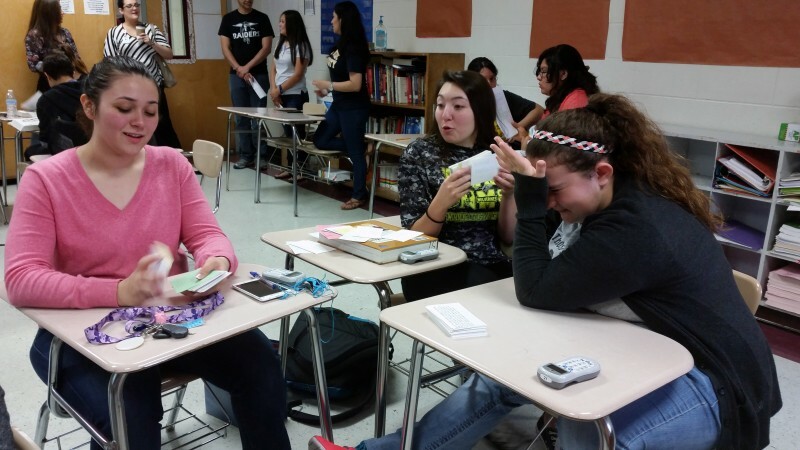 By sophomore and junior year, Balleza learned how to balance her time, to say no to going to the mall when college coursework was too demanding and to seek out help from South Texas College’s tutoring centers when calculus got too hard. Although Balleza took several classes on the college campus, the majority of college courses that PSJA students take are done at their high school. Although occasionally college instructors will come to the high school, many of the courses are taught by high school teachers. They must meet the college’s criteria for teaching, including having at least a master’s degree, and go through the same hiring process as all other South Texas College faculty. Keeping so much of the program on the high school campuses is intentional – it makes it easier to grow the program districtwide, King said. It also allows the program to double up to make it possible for students to earn as many credits as possible: many classes count for both high school and college credit. For example, things like U.S. History are both Advanced Placement courses and college classes. Balleza and other students said high school teachers, who are certified by the college and follow its curriculum, try to mimic a college environment in their college courses. They deliberately give the students more space and responsibility to remember assignments on their own. Some dual enrollment skeptics have questioned whether the rigor of these high school college courses actually matches that of a traditional college course. In 2011, for instance, a professor at the University of Texas-Pan American (UTPA), which receives early college students from many districts the Valley, told a local paper that the program set students up for failure at the university. Shortly after his remarks, however, UTPA administrators released data showing that students who enter with prior college hours have higher GPAs, retention rates and graduation rates than those who do not. The trend holds true today, said Magdalena Hinojosa, associate vice president for student enrollment. Hinojosa’s research does show that how well high school students perform in their college courses is a big predictor of future success, however. UTPA’s overall four year graduation rate is 18 percent. For students who have at least a 3.0 GPA in their prior college courses, it’s 41. For students who have a 2.5 to 2.9 GPA (which is where PSJA’s average lies), it’s 25 percent. PSJA districtwide data hints that challenges may lay ahead when all students must take the college entrance exam and enroll in college courses. In 2014, only 26 percent of students met postsecondary readiness standards on state standardized tests in at least two subjects, compared to 41 percent statewide. The district’s average ACT score was 17, 3.6 points below the state average. As early college expands, the district has built in supports to help students during and after high school. It has become aggressive about making sure students are applying to colleges and filling out financial aid applications and encouraging them to think beyond their certificate or associate’s degree. It has also created advising programs to help graduating seniors transition to colleges in the area, with district employees working on various campuses to help them through their freshman year. Balleza won’t be able to take advantage of them; she’s at Webster University in St. Louis to study wig and makeup design. Eventually she hopes to work on Broadway. With an associate’s degree in interdisciplinary studies, she’s got enough of a jump start to double major. It was the day before her 18th birthday and two weeks before she’d walk across a different stage to collect her high school diploma. This story was produced byÂ The Hechinger Report, a nonprofit, independent news organization focused on inequality and innovation in education. Read more aboutÂ high school reform.